With the release of Windows Server 2019, which includes a ton of Hybrid Cloud integration features, it was time to build a new lab environment. The plan is to create a lab and demo environment for my presentations and workshops. Until today, I was still using my hardware from 2011, which was built from Cisco C200 and HPE ProLiant servers. This was, more or less, datacenter grade hardware, it was using a lot of electricity and made a lot of noise. Not really the thing for a home lab on your desk. 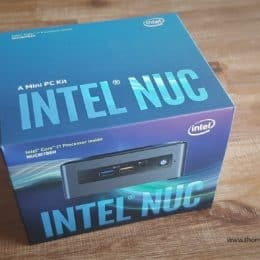 With some pretty good deals out there, I decided to buy a brand-new Intel NUC. NUC stands for Next Unit of Computing, which is a small, light, cheap and not very noisy computer, which gives you the latest Intel CPUs and ports. Mostly used as desktop or media computers. However, the price and the features, are also making it a great option for a lab running Hyper-V. If I look at the hardware our customers are using today, there is not really a good way to build a cheap home lab based on datacenter hardware. And with my workloads mostly running in Azure anyway, the Intel NUC seems to be a great option. For most of my demos a single server running Hyper-V should be enough. For demos on Storage Spaces Direct or Clustering I can still use Azure with Nested Virtualization. Unfortunately, the Intel NUC is limited to 32GB of RAM and this version does not have a TPM chip. The good thing, it runs Windows Server 2019 and Windows Admin Center just fine. So far I don’t have any issues, except that there are some missing drivers for Windows Server 2019. We will see how it works out in the next couple of months. Let me know if you have any questions in the comments.